The 8th Grade Dance is a fun night for all 8th graders that includes a DJ, games, treats and dancing. Join us as we transform the DW cafeteria into a modern dance club for your enjoyment. Tickets are $25 per student. 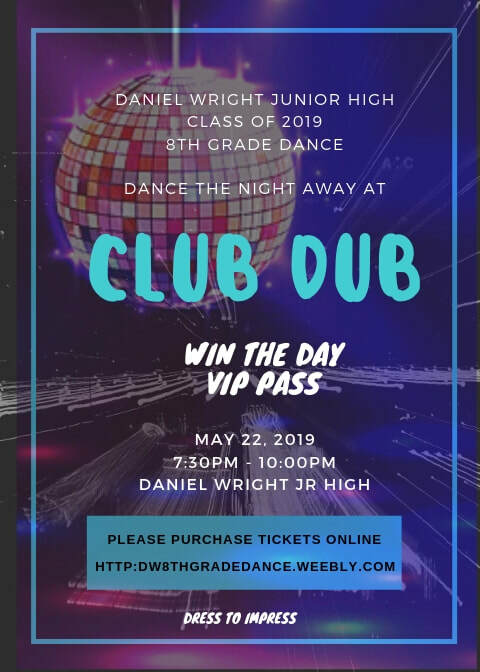 The dance is held at Daniel Wright and will include DJ entertainment and dancing, photo booth, and fun refreshments.​​ This is a fun dance party with all classmates. This is not a dance where students ask a date. Please drop your student off no earlier than 7:00 PM. Students will be able to take pictures outside of the school but will not enter the school until the start of the dance at 7:30. Parents will not be permitted to enter the school with the children. We will post photos of the transformed cafeteria for parents to view online. All food items served at the dance are approved by the school. If you would like more information, please contact the nurses office. The dress code is semi-formal attire: collared shirts and dress shoes, coat and/or tie optional, school appropriate dresses and/or pants. There will be a shoe check area where students can leave their shoes if they wish. *Socks will not be provided at the dance. Students are welcome to bring them, if desired. Paper tickets will not be issue after the electronic purchase. There will be a check-in table as the children enter the dance and those who have purchased tickets will be on a list. We are excited about the festivities leading up to 8th grade graduation. Thank you for making this truly memorable for our students. Tricia Jette & Linda Pinsel (8th Grade Dance Co-Chairs) and the entire dance committee.